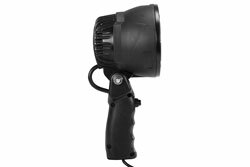 The HUL-LED25WRE-12.3-50GCR-24I from Larson Electronics is a Handheld LED Spotlight w/ 50` Cord Reel that combines high output Cree LEDs and a 120mm parabolic reflector to deliver a powerful 2,000 lumens with a focused beam reach of over 1,000 feet while drawing only 25 watts of power. The cord reel contains 50 feet of 12/3 SOOW cable to provide plenty of reach around the work area or job site. An inline transformer takes input current ranging from 100 to 277 VAC and will output 24 Volt DC current at 6.25 amps in order to operate the spotlight. The HUL-LED25WRE-12.3-50GCR-24I offers operators a versatile and powerful handheld lighting solution for a wide variety of different locations including warehouses, garages, shops, farm buildings and storage facilities just to name a few. The spotlight and transformer on this unit both feature an IP67 waterproof rating which allow this LED spotlight with cord reel to be used in areas where moisture or water may be present as well as in both indoor and rough outdoor conditions. Spotlight Features:The spotlight on the HUL-LED25WRE-12.3-50GCR-24I delivers an impressive 2,000 lumens while drawing only 25 watts of energy. With a combination of high output Cree LEDs and a 120mm parabolic reflector, this spotlight projects a tightly focused cool white beam reaching up to 1,000 feet. This beam clearly and sharply illuminates objects all the way to the end of the beam reach. The Cree LED units in this light have been chosen for their high lumen per watt ratio and extreme longevity. These Cree LEDs generate 80 lumens per watt effective lumen output and have a 70% lumen retention at 50,000 hours, giving them better efficiency and operational life than traditional light sources. 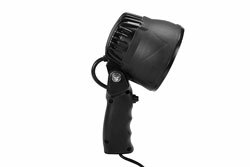 This IP67 rated spotlight features an ultra-durable ABS polymer body, an aluminum alloy light head housing, and an impact resistant polycarbonate lens. Waterproof, dustproof, and shockproof, the HUL-LED25WRE-CPR is built to work hard and survive demanding outdoor use. While the HUL-LED25WRE-12.3-50GCR-24I spotlight is built to withstand rugged use and harsh outdoor conditions, comfort and ease of operation haven`t been sacrificed. This unit is ergonomically designed for balanced and comfortable handling. 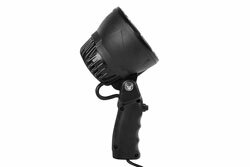 The HUL-LED25WRE-12.3-50GCR-24I LED spotlight features an articulated light head that can be tilted up and down independently of the handle for more precise beam positioning. The nylon handle has a no-slip textured surface that ensures a firm grip even in wet conditions. The booted push button provides additional protection from dust and water and is conveniently placed to allow operators easy forefinger access to the switch for quick on/off action even while wearing gloves. Cree Specific: This lamp uses Cree LED units that have been chosen for their high lumen per watt ratio and extreme longevity. These Cree LEDs generate a robust 80 lumens per watt effective lumen output and have a 70% lumen retention at 50,000 hours, giving them better efficiency and operational life than traditional light sources. The Cree LED units in this light have been chosen for their high lumen per watt ratio and extreme longevity. These Cree LEDs generate 80 lumens per watt effective lumen output and have a 70% lumen retention at 50,000 hours, giving them better efficiency and operational life than traditional light sources. Transformer: The HUL-LED25WRE-12.3-50GCR-24I features an inline transformer that takes input current ranging from 100-277V AC and converts it into 24V DC to operate the spotlight. The transformer is connected to the cord reel via a one foot whip and Deutsch connector. The other side of the transformer is equipped with a second 1` whip that is terminated in a choice of general area cord caps. Integrally designed protection includes overload, short circuit and over voltage safeguards to prevent overheating and unit damage in case of faults or overly heavy current draw. This unit will shut down when an over current or over voltage condition is encountered and recovers when manually turned back on. The HUL-LED25WRE-12.3-50GCR-24I transformer has a -30°C to +70°C operating temperature range and is UL UL1012 and UL60950-1 compliant as well as compliant with worldwide safety regulations for lighting. This unit has a 92% conversion efficiency and is suitable for use with moving LED signs and similar LED equipment. This transformer is rated IP67 waterproof which makes it suitable for both indoor and outdoor use.